Getting away from the web will be a torture, oh, and don’t mind the ideological biases contained in them (in case you are wondering, yes, i’m not so religious), since they have interesting things to say. The experiment has been a while since it came out, but it is so fascinating and exciting that I have to post about it. It is basically about an experiment done by Richard Lenski with bacterias that could only eat glucose, and after 20 years, around 40,000 generations, they could eat ascorbate. That is amazing! It is a big leap. According to the paper, three mutations had to occur. After this one mutation around generation 20,000, they found out it made it easier for the bacterias to mutate into ascorbate eating ones. They did it by freezing bacterias every some generations and reviving them to repeat it. The neurologist Vilayanur Ramachandran explains how scientists can find out more about the brain by looking inside of brains that is not normal or injured. In it, he examines three oddities: People who can’t recognize faces or recognize faces but thinks the person is a stranger, phantom limbs (people can feel their limbs even though it is cut off), and synesthesia (the mixing of senses, like certain numbers make people see certain colors). In it, he explains why he thinks those things happens and gives you insight of the inner workings of the brain, and how he finds about it. I especially like the part of synesthesia, sounds like a cool thing to have 🙂 . Oh, and anyone reading this should check out other TED lectures, K? 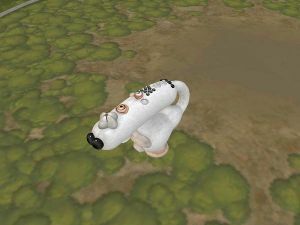 The spore creature creator recently came out, and with it a lot of weirdness. My brother have created a lot of weirdness with it, but I have seen creatures created from the image of videogame characters/monsters, and in the case of the image below, a wiimote. Or at least Catholic church is. I have to go every Sunday, which I think is one hour wasted from my time. You multiply that by the amount of days I have gone, that is like… Idon’t know, but you know the point. Sometimes, though, I have to wear a white robe and stand on the frot like statues, and sometimes “help” the pastor. Those days are extra boring and tiresome. And damn, I am going to camp next week, which is religious and lasts three days. They dedicate like 2 hours to bible stuff, so that is like going to church 6 times in three days. I at least enjoyed the stories they told at protestant church sessions. The worst part in any church, in my mind, is the singing session. I think they are horrible, loong, and … horrible. I have always wanted to do math proof, but it is kind of hard XD . Now, I lately have been reading about vectors (yeah, i know, it is kind of nerdy, but school never teach me science well or what I want to learn well), and there is something called the cross product. You are currently browsing the IBY's Island Universe blog archives for June, 2008.